When I first saw Trekkies at a local bookstore, I wasn't too eager to get the book. As much as I'm a Star Trek fan, something about the book seemed too cheesy and I was genuinely worried that it would just end up being a bad parody title that made fun of Star Trek fans in the same way The Big Bang Theory is accused of mocking geek culture. As with many books though, all it took was a low enough Kindle Daily Deal to eventually hook me in. I picked up an ebook copy of the title and finally found the time to read it somewhat recently. And as far as a weird parody piece involving Star Trek fans and zombies, it actually wasn't that bad. And as I progressed through the novel, I had to admit that I could only marvel at the author's ability to write an authentic Star Trek fan story while still marrying it in a meaningful way to the zombie genre. I actually liked this book a lot more than Pride and Prejudice and Zombies since it managed to combine the two genres a lot better. Plus it's a lot more brilliant than it lets on. Synopsis: Night of the Living Trekkies is a parody science fiction zombie story written by Kevin David Anderson. It was released under the Quirk Fiction imprint, which includes the more other horror genre mash-up classics. Jim Pike was once a major Star Trek fan, but his tours of duty in Afghanistan has made believing in the brighter future often alluded to in Star Trek that much harder. Now he works in some dead end hotel in Houston, Texas in an effort to have as little responsibility as possible. And this weekend the Botany Bay Hotel is host to an annual Star Trek convention. Thus he's now surrounded by all sort of costumed Star Trek fans. But an incident at a nearby secret military facility has released a strange virus into the area - one that essentially turns people into zombies. And one thing leads to another and convention attendees start turning into zombies - but with everyone in costume, folks don't realize this fact right away. And with Jim's old Star Trek friends arrive, he starts to pick up on things not being on the level. And soon he must embrace his inner Starfleet officer in order to guide his friends out of this disaster. The book goes through all the "traditional" (read: tropes) of a zombie story at first. We have the reveal of the cause of the zombies (the military incident), and then the first reports of possible zombie activity that are ignored (random reports of being bitten by fellow patrons), until they accept the truth of things (zombies!) and then the effort to escape the carnage. And initially thought that this was just going to be a zombie story with folks coincidentally in Star Trek costumes. But thankfully, this wasn't the case. Beyond the initial bits involving convention attendees spewing out random Star Trek facts, selling relevant merchandise, or hoping for fresh gagh (actually jelly worms). There were cute bits like obscure characters (I'm dressed as the EMH from Star Trek: First Contact and not from the Voyager TV series). But then things shifted later on. Jim Pike struggles to keep his new friends focused on survival and the horrors of dealing with an actual zombie epidemic are a bit too much. And it's because of their shared love for Star Trek that Jim manages to find a way to rally them to the cause. And it doesn't sound too cheesy - his use of Star Trek ideals to find a way forward is downright awesome and ties to why a lot of us are proud fans of the series. 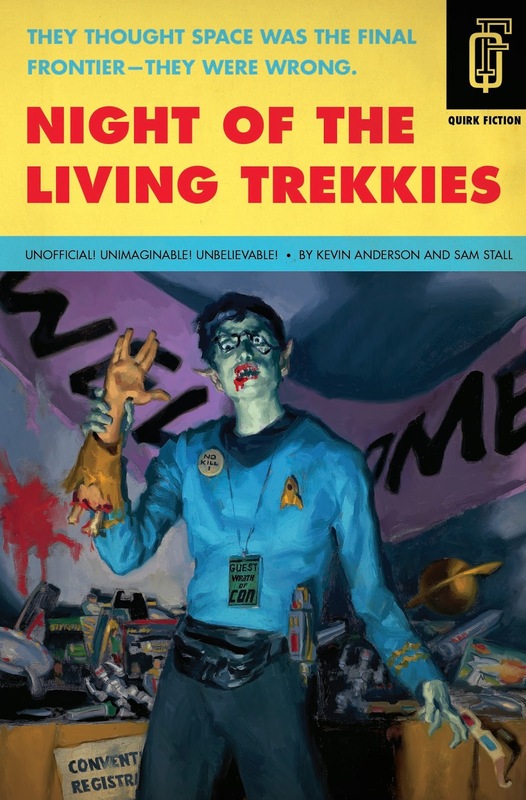 Whether you call yourself a Trekkie or a Trekker (personally, I feel there is no need to distinguish fans in this manner), Night of the Living Trekkies isn't just a zombie story with Star Trek trappings. Instead, it's actually a Star Trek story set in a city overrun by zombies with our protagonists trying to be true to the Star Trek vision. And I rate this book as a very fun 4.5 humorously appropriate Star Trek references made out of a possible 5.